So complete is our identification of boredom as the default state of human existence that when asked to define it, most people say, "Boredom is when there is nothing to do." That this is an unpleasant state is by no means a logical necessity. Not only pre-modern people, but the entire animal kingdom seems to be perfectly fine with inactivity. This observation calls into question one of the fundamental tenets of the conventional explanation of the history of technology, which Stephen Buhner names the "anxiety theory" in the context of the invention of brewing. More broadly, the concept is that human technological progress in general is driven by the struggle to survive, and that this struggle, this precariousness of existence, expresses itself in the human organism's physiology and psychology as anxiety, which is eased by creating better means to survive. Anxiety, then, is the way that threats to survival are translated into action to mitigate those threats. We can restate the anxiety theory as follows: (1) life is dangerous and survival difficult; (2) this makes us feel anxious; (3) the unpleasantness of this feeling drives us to control the dangerous/difficult circumstances, for example through technology; (4) we now feel less anxious. On an individual level, the anxiety theory purports to explain boredom as follows: we really cannot afford to sit there and do nothing. If life is a competition for survival, then our genes should drive us to make the best possible use of each moment to augment our chances of survival and reproduction. Sitting around doing nothing goes against our genetic programming, which generates feelings of discomfort that impel us to do something productive. Certainly this is what many people feel during empty moments or deliberate experiments at meditation: a churning unease that says, "I should be doing something." This cultural compulsion is so strong that even spiritual practices such as meditation and prayer are easily converted into just another thing to do, moments mortgaged to the campaign of improving life. Is the anxiety theory true? Ask some random people on the street and you will find that most would not want to go back to a primitive life before technology. We assume a dark picture of the primitive life as an uncomfortable, never-ending struggle for existence. This assumption is at the root of our cultural belief that technology has rescued us from the caprices of nature and enabled us to develop our higher potential. Here we have, in a nutshell, "the ascent of humanity." The main problem with this view is that life in the Stone Age was not necessarily "nasty, brutish, and short" at all. Ethnographic studies of isolated Stone Age hunter-gatherers and pre-modern agriculturalists suggest that "primitive" peoples, far from being driven by anxiety, lived lives of relative leisure and affluence. An oft-cited example is the !Kung of the Kalihari Desert in southern Africa, who were studied by the anthropologist Richard Lee. He followed them around for four weeks, kept a log of all their activities, and calculated an average workweek of approximately twenty hours spent in subsistence activities. This figure was confirmed by subsequent studies by Lee and other researchers in the same region. In one of the harshest climates in the world, the !Kung enjoyed a leisurely life with high nutritional intake. This compares to the modern standard of forty hours of work per week. If we add in commuting time, shopping, housework, cooking and so forth, the typical American spends about eighty hours per week aside from leisure time, eating, and sleep. The comparable figure for the !Kung is forty hours including such necessary activities as making tools and clothes. Primitive small-scale agriculturalists enjoyed a similar unhurried pace of life. Consider Helena Norberg-Hodge's description of pre-modern Ladakh, a region in the Indian portion of the Tibetan Plateau. Despite a growing season only four months long, Ladakh enjoyed regular food surpluses, long and frequent festivals and celebrations, and ample leisure time (especially in winter when there was little field work to do). This, despite the harsh climate and the (proportionately) enormous population of non-working Buddhist monks in that country's numerous monasteries! More powerfully than any statistic, Norberg-Hodge's video documentary Ancient Futures conveys a sense of the leisurely pace of life there: villagers chat or sing as they work, taking plenty of long breaks even at the busiest time of the year. As the narrator says, "work and leisure are one." Early European accounts of this continent's opulence border on the unbelievable. Time and again we read of "goodly woods, full of Deere, Conies, Hares, and Fowle, even in the middest of Summer, in incredible aboundance," of islands "as completely covered with birds, which nest there, as a field is covered with grass," of rivers so full of salmon that "at night one is unable to sleep, so greate is the noise they make" . . . They describe rivers so thick with fish that they "could be taken not only with a net but in baskets let down [and weighted with] a stone." These and other wonders—flocks of passenger pigeons and Eskimo curlews (both now extinct) that darkened the sky for days—comprised the provenance of this continent's native inhabitants. How much of a struggle could life have been? Note as well that this cornucopia existed despite humans having inhabited the continent for at least 12,000 years. It was not as if the Native Americans hadn't sufficient time to deplete nature's resources. We cannot conclude that their attitude of easy abundance was a temporary consequence of rich natural capital; their relationship with nature also preserved and sustained that abundance. [The hunter] adopts a studied unconcern, which expresses itself in two complementary economic inclinations. The first, prodigality: the propensity to eat right through all the food in the camp, even during objectively difficult times, "as if", Lillian said of the Montagnais, "the game they were to hunt was shut up in a stable". Basedow wrote of native Australians, their motto "might be interpreted in words to the effect that while there is plenty for today never care about tomorrow. On this account an Aboriginal inclined to make one feast of his supplies, in preference to a modest meal now and another by and by." . . . . A second and complementary inclination is merely prodigality's negative side: the failure to put by food surpluses, to develop food storage. For many hunters and gatherers, it appears, food storage cannot be proved technically impossible, nor is it certain that the people are unaware of the possibility. One must investigate instead what in the situation precludes the attempt. Gusinde asked this question, and for the Yahgan found the answer in the self same justifiable optimism. Storage would be "superfluous", "because through the entire year and with almost limitless generosity the she puts all kinds of animals at the disposal of the man who hunts and the woman who gathers. Storm or accident will deprive a family of these things for no more than a few days. Generally no one need reckon with the danger of hunger, and everyone almost anywhere finds an abundance of what he needs. Why then should anyone worry about food for the future... Basically our Fuegians know that they need not fear for the future, hence they do not pile up supplies. Year in and year out they can look forward to the next day, free of care...."
Significantly, aboriginal peoples typically refer to food as a "gift" from the land, the forest, or the sea. To us moderns it is a charming metaphor; to pre-agricultural people the providence of the earth was a living reality. The land provides all things—plants grow, animals are born—without the necessity of human effort or planning. Gifts are not something that must be earned. To see life in terms of receiving gifts bespeaks an attitude of abundance and naturally fosters a mentality of gratitude. Only with agriculture did the freely received gifts of the land become objects of exchange, first an exchange of work for harvest, and eventually the objects of commerce. In contrast, the mentality of the gift corresponds to the forager's nonchalance, which makes sense when the necessities of life are provided and not extracted. Maybe we can still rescue the anxiety theory—what about disease? When I ask students to identify the most valuable achievements of modern technology, they invariably point to medicine, which they claim has given us levels of health, security, and longevity unprecedented in history. Such a view, however, fails to recognize the power and sophistication of traditional herbal medicine for curing the wounds and diseases common in those times. It also must contend with the observations of Weston Price, an American dentist who lived in the early twentieth century. Price was curious about the decline of dental health he had seen over the decades of his practice, and hypothesized that the rapid increase in the prevalence of tooth decay, crowded dentition, and a host of other, formerly rare, non-dental maladies had something to do with our diets. He quit his practice and spent many years traveling to remote corners of the world where people still lived without modern foods. The societies he visited weren't all Stone Age, but they were primitive by our standards. He went to remote Swiss villages accessible only by mule, and to the outer islands of Scotland; he lived with the Masai in Africa, the Inuit in Alaska, the aborigines in Australia, Polynesians in the Pacific. In all these places he found almost no tooth decay, no obesity, no heart disease, and no cancer. Instead he observed magnificent physical stamina, easy childbirth, and broad jaws with all 32 teeth. The diets were different everywhere but there were some things in common. People ate very few refined carbohydrates, plenty of live fermented food, and substantial quantities of fats and organ meats. Their vitamin intake was many times greater than the norm today. Price's work lends support to the contention that at least in some respects, primitive people enjoyed better health than is the norm today, even without the modern medicine that we think keeps us healthy. I do not mean to idealize life before modern technology. Certainly, we were more subject to the elements: heat, cold, rain, and wind. In Ladakh, people were cold a lot in the wintertime. For the !Kung at certain times of year the best foods were hard to come by and people typically would lose a few pounds over the dry season. Sometimes people would be hungry. While infectious diseases were rare in the days before high concentrations of population, and degenerative diseases rare before the advent of industrial food processing, other threats to life and limb abounded. Sometimes a child would be killed by a lion or a hyena. The !Kung, a peaceful and sharing people, even experienced occasional homicide, usually sparked by sexual jealousy, resulting in intermittent blood feuds spanning decades. In other parts of the globe, hunter-gatherer tribes lived in a state of constant low-level warfare with occasional outbreaks of horrendous violence—or so it is claimed. Most famous are tribes of the New Guinea highlands, with reported adult male mortality rates from violence of 20-30%, and the Yanomamo Indians of the Amazon, immortalized by Napoleon Chagnon in his book, Yanomamo: The Fierce People. Chagnon claims that these "living ancestors" lived in a state of perpetual warfare in which some 44% of adult males have killed. Others maintain that his figures are greatly exaggerated. A lot is at stake: perhaps violence is coded into our genes. Chagnon's mentor, geneticist James Neel, "thought that modern culture, with its supportive interventions on behalf of the weak, was 'dysgenic.' It had strayed too far from humankind's original 'population structures': small, relatively isolated tribal groups where men competed with one another—violently—for access to women. In these societies, Neel assumed, the best fighters would have the most wives and children, and pass on more of their genetic 'index of innate ability' to the next generation, leading to a continual upgrading of the quality of the gene pool." Have we ascended from a Hobbesian past of violence and fear? How else can we interpret the warlike nature of so many of the primitive peoples we have encountered? Is our species consigned to perpetual war until we have, through culture, overcome the genetic programming of the dominating "demonic males"? In 1995, Brian Ferguson, an anthropologist at Rutgers University, published a book entitled "Yanomami Warfare: A Political History," which challenged the sociobiological theories drawn from "The Fierce People" and other studies by Chagnon. Ferguson, whose book analyzes hundreds of sources, wrote that most of the Yanomami wars on record were caused by outside disturbances, particularly by the introduction of steel goods and new diseases. Ferguson noted that axes and machetes became highly coveted among the Yanomami as agricultural tools and as commodities for trade. In his account, evangelical missionaries, who arrived in Yanomami territory during the fifties, inadvertently plunged the region into war when they disbursed axes and machetes to win converts. In time, some of the missions became centers of stability and sources of much needed medicine. But Chagnon, whose study of Yanomami mortality rates took him from village to village, dispensed steel goods in order to persuade the people to give him the names of their dead relatives—a violation of tribal taboos. . . . these methods destabilized the region—in effect, promoted the sort of warfare that Chagnon attributed to the Yanomami's ferocity. This may be an extreme example, but the principle is clear. It is very difficult to know what any society was like "pre-contact". The effects of Western technology, germs, and commerce typically precede the first anthropologists to even the most remote regions, initiating social breakdown. The same goes for non-humans. As primatologist Margaret Power demonstrates, the murderous behavior of chimpanzees in the wild, cited as evidence of our innate badness, emerges only in disturbed populations (which, strictly speaking, are the only ones accessible to researchers). Specifically, the methods that researchers use reduce mobility and generate conflict. When we see the warlike nature of primates and primitives, we may be seeing mostly our own shadow. The debate over primitive savagery goes back at least to Rousseau's "noble savage" versus Hobbes' "nasty, brutish, and short" state of nature. It rages on today. I leave the question to anthropologists, but one thing is clear: Death, whether by human or natural agency, was a very visible part of life in primitive times. Death and discomfort are less visible today, but this does not mean we have conquered them. We have only hidden them away. Perhaps, even if Hobbes was right, our ascent is an illusion. Nature, too, can be cruel, at least from our present perspective. What of those millions of tadpoles devoured by fish before they can ever enjoy the pleasures of froghood? Most animals have natural predators, except for a few top carnivores and the hugest herbivores, who must face their own brand of uncertainty. The Technological Program notwithstanding, life at all levels is inherently uncertain. Yet somehow, the rest of the animal kingdom does not seem beset by anxiety. Animals spend lots of time grooming, playing, and just loafing around. Do birds really need to spend all that time singing to find a mate and establish territory? Even bees, the epitome of busyness, spend lots of time in the hive apparently doing nothing at all. The unnaturalness of constant anxiety is also written into our physiology, which is not designed to handle constant stimulation of the sympathetic nervous system and its stress hormones. We have evolved to handle conditions of general leisure and relaxation, punctuated by the occasional burst of emergency overdrive. Many physiological functions, such as digestion, tissue-building, and immunity, operate only under conditions of relaxation. The stress we consider normal interferes with them and damages our health. The Yamana are not capable of continuous, daily hard labor, much to the chagrin of European farmers and employers for whom they often work. Their work is more a matter of fits and starts, and in these occasional efforts they can develop considerable energy for a certain time. After that, however, they show a desire for an incalculably long rest period during which they lie about doing nothing, without showing great fatigue. . . It is obvious that repeated irregularities of this kind make the European employer despair, but the Indian cannot help it. It is his natural disposition. A racist interpretation of this passage is easily remedied by acknowledging the sneaking suspicion that this is our natural disposition too. "Their work is a matter of fits and starts..." Does that not describe a child as well? Reader, do you sometimes feel the desire to "rest" even when you're not actually tired? That our actual behavior contradicts our "natural disposition" testifies to the power of our acculturation. We have been convinced that we cannot afford to live like that, and so we condition ourselves and our children to override their "natural disposition" and work hard. Just as technology seeks to improve upon nature, so does culture seek to improve upon human nature. The denial of Stone Age affluence is ideologically necessary, else the myth of ascent would lose its foundation. The Hobbesian view of the state of nature—nasty, brutish, and short—motivates and justifies the entire Technological Program. It is implicit in the myth of progress and the ideology of ascent. That is also why many in the opposing camp, who affirm Stone Age affluence, see technology and culture as a long series of blunders, a Fall, a descent. Another view is possible, however. Perhaps our eons-long accumulation of technology and culture has a different purpose entirely—neither the minimization of suffering nor the completion of control—that we have yet to recognize. Another reason why we assume that life in the past was a struggle for survival, ruled by anxiety, is that we project our own experience onto the past. As Stephen Buhner points out, any of us would certainly be quite anxious, and have to struggle to survive, if we were plunked down suddenly into primitive conditions. But there is a deeper aspect of projection: We believe that anxiety ruled their lives, because anxiety rules our lives. We are the ones who feel that life is a struggle for survival, not they. Consider our economic paradigm. Whereas in primitive societies cooperation was the rule, in our society it is competition. More for you means less for me. I've got to stake out my territory and protect my interests. Even education is based on competition for grades (which are implicitly associated with eventual success in life; i.e., survival). Both our ontology and our economics set us in competition with one another and therefore generate anxiety. However, the best way to see the powerful role of anxiety in our lives is on a personal level, by examining the emotions and considerations that determine important life decisions. Every semester at Penn State I take a poll of my students, and ask them to complete the following sentence: "I am at Penn State . . ." (a) to get a degree so I can get a good job; (b) because my parents expect me to and I don't want to let them down; (c) I don't know, college comes after high school; (d) because this is where I can satisfy my thirst for knowledge. Semester after semester, a consistent 70-90% of the students choose "a". "B" and "c" typically draw 5-10% of responses, while "d" averages 2-5%. In other words, most of the students are at Penn State because they feel that they have to be here—have to be here in order to get a degree, which means a secure job, which means money, which we need for the basic necessities of survival: food, shelter, and clothing. "In other words," I tell them, "you are here at Penn State, at least in large part, due to survival anxiety. Hey, it's a beautiful day! Why don't you spend the afternoon playing frisbee? Why don't you go hang out with your friends? Why don't you play your guitar on Old Main lawn? Is it because you love your classes and studies so much you cannot tear yourself away from them? Hey, you are young. Why don't you travel the world?" It is because they feel they "can't afford to", that it isn't practical, that it would somehow interfere with their ability to achieve financial security. And even these are mere rationalizations for an ambient dread and guilt that informs their every moment of leisure. I gave a class assignment requirig students to go home and spend 15 minutes doing absolutely nothing. One student wrote, "Pretty much the whole 15 minutes all I could think about was what work I could have been getting done." This is a typical response. Because our culture so closely associates money with survival, the refrain "I cannot afford to" gives us a glimpse of the survival anxiety that underlies so many of our life decisions, large and small. "I cannot afford to" is certainly not confined to contexts involving purchases. It points to the monetization of all life. As the sphere of monetized human activity grows, so also grows the pervasiveness of the anxiety arising from a scarcity- and competition-inducing money system. To choose based on what we can afford is to choose from a position of lack. The mechanics of interest-based money, which I describe in Chapter Four, ensure that we never have enough. It is because anxiety is such a powerful force in our lives, that we project it onto primitive life and assume that it, too, was driven by anxiety. We also project our own anxiety onto biology when we see it primarily as a competition driven by the imperatives of survival and reproduction. The anxiety theory is essentially a restatement of Darwinism applied to human technological development. The genes of any organism will program it to do everything it can to negate threats to its survival; any gene that did not do this would surely exit the gene pool. Anxiety is one of these programs (terror is another). Technological progress, then, is viewed as an expression of the Darwinian drive to survive. As in economics, biology posits discrete individual actors, i.e. Genes, behaving to maximize their self-interest, the means to survive and reproduce. Our very understanding of biology, i.e. of life, and in particular of progress in biology, i.e. of evolution, rests on a foundation of competition for survival. It is no wonder that we see human life and human progress in the same terms. The anxiety that defines so much of modern life is built into our conception of what it is to be alive and what it is to be human. The view of life as a struggle for survival is woven into our world-view on a much deeper level than Darwinism. In fact, our guiding scientific paradigms can admit no alternative. Competition is implicit in our culture's very conception of the self as an independent entity, distinct and separate from the environment and from other beings. This conception reached its fully developed form with Descartes, who identified the self as a discrete point of conscious awareness, a non-material soul separate from material reality, and with Francis Bacon, who enunciated the ideal of objectivity in science and the independence of the observer from factual reality. The foundations of science entail separation. When the definition of the self (and more generally, of an organism) is exclusive and discrete, any interdependency is therefore contingent on circumstances and can in principle be eliminated. This is known as "independence" or "security"—not to depend on others. Beings are naturally set in competition with one another, because more for me is less for you. The other key feature of Darwinism that conforms to our basic scientific ideology is its purposelessness or randomness, features which comprise yet another source of our anxiety. Darwinism represents a valiant attempt to reconcile life's order and spontaneity with the mechanical, deterministic laws of (classical) physics. In the words of one of Darwinism's most eloquent exponents, Richard Dawkins, "The universe we observe has precisely the properties we should expect if there is, at bottom, no design, no purpose, no evil and no good, nothing but blind, pitiless indifference." The classical understanding of the universe, in which all things are composed of atoms and void, gives rise to a further level of anxiety, one that the reader may have felt upon reading the Dawkins quote above. This is, to quote Robert Lenoble, the "anxiety of modern man" that comes from the recognition that we, too, are comprised of nothing more nor less than any other object in the universe: atoms and void. Perhaps underneath the arbitrarily discrete beingness we have assigned ourselves lurks a kind of existential panic, the suspicion that perhaps, in some fundamental sense, we do not exist at all. Herein also lies an alienation of the human spirit from the cold, deterministic, impersonal laws of physics, a sense that something essential is left out. Sigmund Freud is often quoted as saying, "The goal of psychoanalysis is to convert neurotic misery into ordinary unhappiness." Actually he has been misquoted and taken out of context, but the very fact of the misquotation's tenacity points to the impossibility of finding real happiness within our present world view. We can distract ourselves from the misery of purposelessness, emptiness, and meaninglessness, but they are always there waiting for us. Anxiety and boredom flow from a common confluence of sources. Technology has separated us from each other, from nature, and from ourselves, inflicting the interior wound of separation. Secondly, the definition of the self as a discrete entity, fundamentally separate from other beings and the environment, contributes to our psychological loneliness. Thirdly, the competitive view of the world that is inseparable from the edifice of science weaves anxiety into the very fabric of life, which becomes a competition for survival. Finally, the belief that the universe at its most fundamental level consists of atomic particles interacting according to impersonal forces creates an existential insecurity, an alienation from the living, enspirited world and selves we intuitively sense. Our society is based upon competition and anxiety in part because these are implicit in our basic understanding of the universe. To forge a new psychology—and, collectively, a new society—that is not underpinned by anxiety, will therefore require a new conception of self and life, and therefore of science and the universe. Other societies, fast disappearing under the deluge of Western culture, were remarkably free from the ambient anxiety we know today. It is no coincidence that their social systems were based on cooperation and that their self-definitions were not atomistic like ours are, but relativistic: defined in relationship to a greater whole such as family, village, forest, nature. 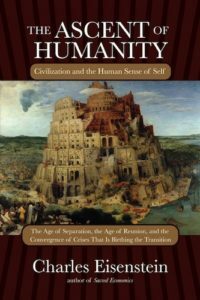 It is a primary goal of this book to establish a different conception of life and self, founded on both scientific and psychological reasoning, from which a different sort of society might naturally grow. When our basic ontology and self-definition changes, everything else will change with it. How will this happen? What might it change into? To answer these questions, in the next chapter I will discuss how the ascent of separation got started in the first place, tracing it back to well before the beginning of what we call "technology". Knowing the state we have departed, we may better envision the state to which we might attain. Understanding the dynamics of separation as an historical process, we may know better how to fulfill that process and grow into a new stage of human development. Stephen Harrod Buhner, Sacred and Healing Herbal Beers. Siris Books, 1998.
iii Norberg-Hodge, Helena. Ancient Futures: Learning From Ladakh. Sierra Club Books, 1992.
iv Derrick Jensen, A Language Older Than Words, Context Books, 2000. p. 85-86.
vi Price's findings appear in his classic work, Nutrition and Physical Degeneration. Price-Pottenger Foundation, 1970.
x Thomas Melancon, Marriage and Reproduction among the Yanomamo Indians of Venezuela. PhD dissertation, UMI, 1982, p 42. Cited in a Brazilian Anthropological Association letter to Anthropology News, 1989.
xi Gregory, Juno. "Macho Anthropology", Salon , Sep. 28, 2000.
xii Tierney, Patrick. "The Fierce Anthropologist" The New Yorker, Nov. 6, 2000.
xiv I spend time watching bees' nests outside my home. Often ten or fifteen bees (wasps, actually) congregate "on the doorstep" outside the hive. Occasionally they will crawl around, touch feelers, and groom, but much of the time they really do nothing at all except wave their antennae or be still. Of course, even then they may be gathering data about their environment, but it is not a stress-induced effort. We need not be driven. Merely by being, we can live in the world. xv Gusinde, Martin. The Yamana, Human Relations Area Files, 1961. p.27, cited by Sahlins, p. 28.
xvi Quoted by Michael Shermer in Scientific American, February 2002, p. 35.
xvii I mean "atoms" in the sense of indivisible minimum units, in this case sub-"atomic" particles. The most recent version of the atom would be the vibrating strings of String Theory. xviii Freud's Studies of Hysteria (1895) ends with the following paragraph: "When I have promised my patients help or improvement by means of cathartic treatment I have often been faced by this objection: 'Why, you tell me yourself that my illness is probably connected with my circumstances and the events of my life. You cannot alter these in any way. How do you propose to help me then?' And I have been able to make this reply: 'No doubt your fate would find it easier than I do to relieve you of your illness. But you will be able to convince yourself that much will be gained if we succeed in transforming your hysterical misery into common unhappiness. With a mental life that has been restored to health you will be better armed against the unhappiness.'"